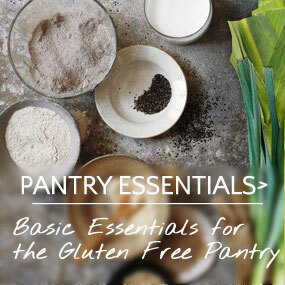 "It Crumbles shares my personal experiences of developing a gluten free lifestyle." Years and years ago, I lived in a studio apartment nested above a family farmhouse, and I called my home the “tree fort.” The kitchen, which overlooked an old red barn, was the size of a postage stamp and the most efficient I’ve ever worked in. My arms could reach everything without taking more than one step. Imagine preparing Julia Child’s chicken crêpes recipe in this tiny space on an apartment-size stove—I suppose not much different from the tiny kitchens in Paris that Julia herself used. Making gluten-free and dairy-free crêpes is easy with Kember’s Gluten-Free Crêpes Mix. And, I’ve re-created The French Chef’s master recipe for the deliciously creamy chicken filling using gluten-free and dairy-free ingredients. Bon appétit! Join It Crumbles to enjoy our newsletter with the latest information, resources, recipes and much more!